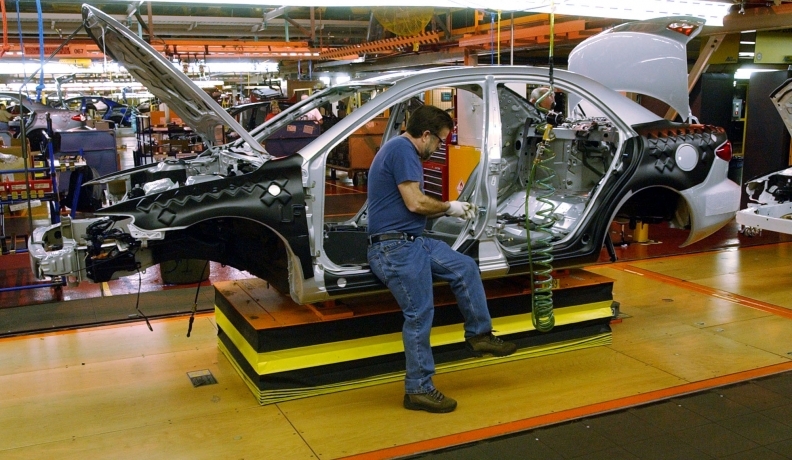 An employee at the AutoAlliance International plant in Flat Rock, Mich., builds a Mazda6 sedan in February 2003. Mazda is studying options for the unprofitable plant operated jointly with longtime partner Ford. TOKYO -- Mazda Motor Corp. is studying various options for its unprofitable U.S. plant operated jointly with longtime partner Ford Motor Co., CFO Kiyoshi Ozaki said today. Japan's second-largest automotive exporter will announce plans for the Flat Rock, Mich., factory by the middle of this year, Ozaki told reporters in Tokyo today. The company may overhaul the plant or change the models built there, he said without elaboration. When asked if Mazda might pull out of the venture, Ozaki said through a translator: "Never say never." The plant currently assembles the Ford Mustang coupe and Mazda6 sedan on one production shift. The Michigan plant produced about 45,000 Mazda6 units and 77,586 Mustang models last year, according to the Automotive News Data Center. The plant needs to run at 70 percent of its full 240,000-unit capacity to make a profit, Ozaki said. Mazda aims to introduce a more fuel-efficient engine to spur demand and increase domestic production to improve economies of scale after slipping into a third-quarter loss. The company's U.S. sales fell 9 percent in January, as increased incentives on Toyota Motor Corp.'s Corolla compact, and demand for Hyundai Motor Co.'s Elantra sapped demand for the Mazda3, Ozaki said. The automaker will need to adjust U.S. inventory by 5,000 units through the end of March, he said. Mazda aims to increase domestic production 33 percent to 1.1 million units in the year ending in March 2016, compared with 827,910 units last fiscal year. The ratio of exports will also increase as demand for cars in Japan declines, he said. Ford reduced its stake in Mazda to 3.5 percent from 11 percent last year, scaling back an alliance of than 30 years. The automaker first formed an automatic-transmission joint venture with Mazda in 1969 and acquired a 25 percent stake in the Japanese automaker in 1979. "We don't believe it is appropriate for us to comment on Mazda's business," Ford spokeswoman Marcey Evans said today. "I don't have a statement or a comment I can make at this time." The U.S. automaker took effective control of the Japanese company in 1996 by raising its stake to 33.4 percent. It reduced the stake to 13 percent in Nov. 2008, and a share issue by Mazda in 2009 further shrank the holding to 11 percent. Mazda plans to introduce its new "Skyactiv" powertrain system across almost all models by 2015, starting with the domestic, U.S. and Australian markets this year. Earlier this month, the automaker reported a third-quarter loss, citing the strength of the Japanese currency which reached a 15-year high in November. The new Demio compact, the first model to use the system, will go on sale in Japan in the first half of 2011 and runs 30 kilometers per liter of gasoline under the Japanese testing system, Mazda said in October. The new car's fuel-economy rating is the same as the hybrid version of Honda Motor Co.'s Fit and better than the current Demio's 23 kilometers per liter. With exports making up 80 percent of its Japanese output in 2010, Mazda is more vulnerable to the yen's impact than its domestic rivals. The strong yen against the dollar cut nine- month operating profit by 13.6 billion yen ($163 million), the company said this month. Mazda posted a net loss of 2.7 billion yen for the three months ended Dec. 31. The company will still meet its full-year profit forecast of 6 billion yen as sales in Japan recover, Ozaki said. While the strong yen erodes profitability of exports, Mazda needs to increase domestic output to boost economies of scale, the company has said. It aims to increase domestic production 33 percent to 1.1 million units in the year ending in March 2016, compared with 827,910 units last fiscal year, Ozaki said. The automaker is also studying whether to begin production in Mexico, adding to a facility in Colombia that has a limited supplier base, he said.